Ascension (2013) is a British short horror film and the directorial debut of James Hart. The screenplay has been adapted from a short story written by Dave Jeffrey from the anthology Alt-Zombie. Filmed in Redditch, during the cold winter of 2013, Ascension tells the tale of a post-apocalyptic world where survivors are few and far between and puts forward strong ideas of community and a breakdown in modern society, echoing back to the Second World War, with everything on ration and people sticking together through hardship. The film opens with a series of news reel’s depicting the gradual stages of the apocalypse and the decline of humanity. With, fast-paced, slick cuts, these moments set the scene for what’s to come. It also must be noted that the opening is accompanied by a chilling score (composed by Liz Comley) that creates a melancholic tone, greatly adding to the film’s atmosphere. 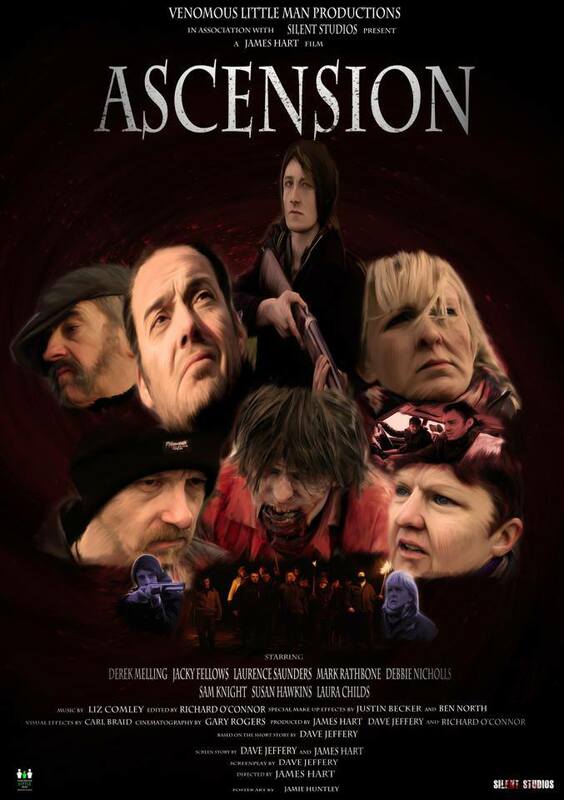 We are then introduced to Ascension’s protagonists Joe (Derek Melling) and Annie (Jacky Fellows), two survivors who are determined to find others to bring back a sense of community spirit (“The Blakewell Spirit”). In a time of crisis the characters still manage to maintain a sense of humor, which is seen throughout the film and is an example of the witty writing in Jeffrey’s script. Our protagonists are joined by Tom (Laurence Saunders) before setting off into the wilderness in the hope of finding others. The characters share a believable dynamic and its clear there is a strong bond and trust between them. On their search they come across brother and sister Alex (Debbie Nicholls), Carl (Sam Knight) and their leader Eddie (Mark Rathbone) who appears as the main antagonist. In a Western-style stand off the characters attempt to convince each other they can be trusted which keeps the audience on the edge-of-their-seats and allows for some intense and confrontational moments as well as ambiguity, nothing is clear cut in regards to who are the good guys and who are the bad? Without revealing anymore, the film concludes with a shocking and heart-wrenching twist that is sure to leave the audience satisfied. Ascension sets itself apart from other texts within the Zombie sub-genre in several ways. Its a very character-driven piece and develops each individual well, providing a lot of empathy for them. The actors are all brilliantly cast and put a lot of heart into the material. It gets the audience on a psychological level, questioning how we ourselves would react if in the same situation and allows an understanding of the motives involved. Another interesting aspect is the film isn’t overly gory and doesn’t feature many zombies which differentiates it in a major way, proving that horror can work well as a backdrop with high drama as the main focus. Isolation is a key theme and its represented well through the location. 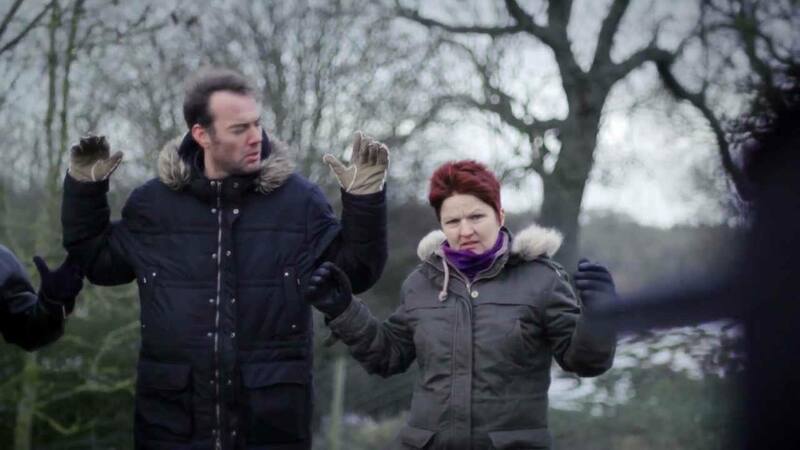 It could be said that Ascension is the coldest zombie film out there due to the weather conditions the cast and crew worked in! There is some stunning cinematography, particularly the aerial shots near the beginning. For a thirty minute film, Ascension manages to convey a lot but still leaves you wanting more which demonstrates that its done its job. To conclude, Ascension is an emotionally-charged, good humored horror story, with well written characters, strong actors, breathtaking cinematography and good direction. Venomous Little Man Productions should be proud of their efforts and hopefully have more wonderful work to come. This entry was posted on July 2, 2013 at 3:38 pm and is filed under Uncategorized with tags Ascension, British Film, Dave Jeffrey, Debbie Nicholls, Derek Melling, Jacky Fellows, James Hart, Laura Childs, Laurence Saunders, Mark Rathbone, Redditch, Sam Knight, Short Film, Venomous Little Man Productions, Zombie Film. You can follow any responses to this entry through the RSS 2.0 feed. You can leave a response, or trackback from your own site. Fab review Miss HayleyR you capture the essence of Ascension without giving away the twists – nice piece! Thank You Mark 🙂 Will also be doing a review of the premiere soon. I’d like to watch this, but I have no idea where to look for it. I guess I should just like their Facebook page and get updates there. Zombie movies need to be unique in some fashion nowadays, and one way is to focus on characters. Sounds like Ascension does that. Its just had its premiere and I believe it has been entered into some upcoming horror festivals. Facebook, Twitter and the official site will be the best places to keep updated. If that’s what you want from a zombie film then I think Ascension will be one for you. Sweet, I’ll be on the lookout! We had a similar reaction to it, it’s an excellent film and deserves to be widely seen! Great review 🙂 I posted it on my Facebook page. No problem 🙂 its a really good review. Hope they get more of them.